Cabin, 2 Bedrooms, 1 Bath. Sleeps 2-6. Beautiful lake views. Peaceful and quiet. Onawim (on a whim!) is just 10 min. off I75. The closest marinas via water are Indian River Marina and Whitman Hollow Marina. The cabin lies right across from mile marker 8. This cozy cottage, nestled amongst dogwood and pine trees is on a private dead-end lane and perches very close to the water. Steps and walkways make for EASY access to the lake. 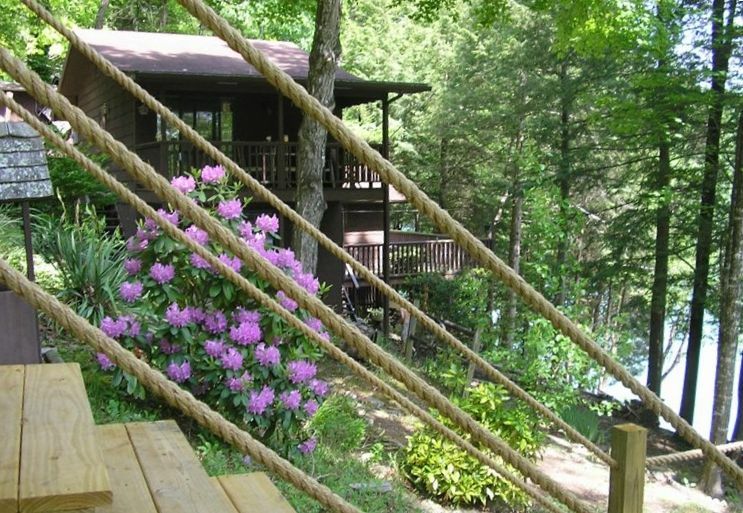 The 2 decks offer bountiful views of the lake and surrounding grounds. One of the decks has a gas grill. The other deck is covered, so you can enjoy it even in inclement weather. You will enjoy the lakeside lower deck which offers relaxing deck chairs and of course, a beautiful view. You can also sit on this shaded lakeside deck and keep an eye on the activities taking place on the dock and water. It's a great place for your morning coffee or 5 o clock cocktail, beer, or glass of wine! You will really enjoy the private dock - both for a place to keep your boat(s) and a place to swim. The swim platform alone is 12x24. That is more than enough room to sunbathe and 'hang-out' on those exquisite summer days! A boat ramp is just 2 minutes away at Indian River Marina. Be sure to enjoy the fire-pit and bring ingredients for smores! You will find the accommodations comfy and cozy, perfect for smaller groups. There are 2 bedrooms. One has a king-size bed and the other has twin bunk beds and a full size bed. There is an eat-in kitchen, outside dining area, laundry area, and a family room. There is a DVD player, stereo, 2 television sets, and wi-fi. The air conditioning and ceiling fans will keep you comfortable on hot summer days. All the windows and doors have screens on them which allow for cool breezes as well. The biggest attraction, of course, is the lake itself. By day or night, the lake beckons you to come out and play. The lake has numerous coves to explore and hang out in. So many coves, so little time! Norris Lake is great for all kinds of water sports and fishing. An added feature is the cabin's pontoon boat which is available for you to reserve. The surrounding area offers countless recreational opportunities as well. The heart of Gatlinburg is approximately 75 miles south. Knoxville is 35 miles south. Come prepared to have a great time! FYI: Owner manages a couple of other lake front properties in the same area. I encourage you to email or call to verify availability of requested time frame. If Onawim is not available, you have an option to check out the other properties! One property is 2 bedrooms, 1 bath and the other is 2 bedrooms, 2 baths. Both are lake front and each have a private dock and great views! If you have a large group, you could reserve all cabins, which sleep up to 17 people. That way you can be together, just not 24/7! My husband and I both grew up in the Midwest. We thought we would move back someday but we discovered Norris Lake back in 2000, and the rest, as they say, is history! We stumbled onto a slice of paradise here on Norris Lake and love sharing that with other lake-lovers! We have spent a tremendous amount of time and energy making this a family-friendly place to come to year after year! From the awesome swim/boat dock, to the decks and fire pit, ONAWIM is a great place from which to enjoy the lake. I never tire of the beauty in and around Norris as well. It is a feast for the eyes! Additionally, East TN is a HUGE play ground. Not only does it have one of the prettiest lakes, but acres and acres dedicated to hiking, four-wheeling, and horseback riding. The outdoor enthusiast has a cornucopia of options! C'mon and enjoy! We choose this area not only because of its proximity to I75 and to town, but also for its privacy and feeling of getting away from it all. The fact that the cabin is on a dead end lane lends itself to being peaceful and quiet. There are two marinas in close proximity to ONAWIM. They are Indian River Marina and Whitman Hollow marina. This end of the lake has a plethora of coves to hang out in, rocks to climb and jump off of,and rope swings. It offers nice and smooth areas to ski or tube, and plenty of places to dangle a fishing line. It is my humble opinion that it doesn't get much better than this! As a guest here, you will really enjoy the night sky, summer sounds, the sun coming over the mountain in the morning, the swim area, the fire pit, the decks, the dock, the peace....I could go on and on. Additionally, it is conveniently located close to town. Food-city and super Wal-mart are approx 5 minutes away. Lowe's, Wal-Green's, CVS, hospital, etc. All nearby. Many views of the lake from every room in the cabin. Covered deck and open deck overlook the lake. No land line but good cell phone reception. Parking on street; Boat & Boat Trailer parking available at nearby marina. Minimum number of towels provided. Please bring your own towels for the lake. On the main floor, off the kitchen, has tv and entrance to covered outside deck. Cabin set up for indoor and out door dining. Gas grill on the lower deck. One in the family room and one in the bedroom with the king size bed. Boat rental available. Please inquire. Nice deck down at the lakeside. Separate fire pit. Cabin has two decks. One is covered and one is open. Both have great views of the lake. Two golf courses near by. Owner has two other cabins in close proximity available for reservation if that would serve your needs to accommodate larger groups. You can be close by to your friends and family but still have your own privacy. Please inquire if interested. We had a great time at Onawim! beautiful! We were blessed to make it in time to watch our MSU Spartans take on Duke in the Elite 8! What a great place it was to witness our team taking Duke down in a nail biting game! We were screaming with joy when Joanne and Gary came to greet us! Luckily they realized that our screams were happy ones and that they didn't have to call the police. Joanne and Gary were awesome hosts and we even had the opportunity to spend some quality time with them on several occasions. Norris Lake is beautiful and the fishing is great too! I highly recommend staying at one of their wonderful cabins! Great Lake view. The cabin was very clean. Good WiFi. Had a wonderful time and the place was perfect for us. Well kept and the owners were extremely helpful. Enjoyed fishing off the dock and kayaking. We even saw a bald eagle perched on a tree. We will come back this summer for more fishing! We loved our weekend there! Quiet place and they were super nice upon arrival! We enjoyed the boat dock just for sun bathing, having fires and breakfast and coffee listening to the boats go by! We came over New Year's with our family for a time to reflect over 2018 and create a family mission statement for 2019 and beyond. We spent wonderful time together in this cozy cottage. We played chess and talked about life on various decks and docks (as it was 65 degrees surprisingly). We played pictionary and euchre, ate ice cream as we gazed at the lake, and asked hard questions that generated deep wells of conversation that will be remembered for many years.... and hopefully generations. This has become a very special place for us. Thank you for such a clean, warm, peaceful setting. Accommodations were great - all the comforts of home !! If it is a rainy day and the lake would be no fun, then Gatlinburg and all it offers is a short drive south. The Appalachian Museum is interesting and near-by in Clinton, TN. Also, the Knoxville zoo. There are different hikes to do around the area. Four-wheeling is very popular in this area as well. There are miles and miles of trails to explore in the surrounding mountains.